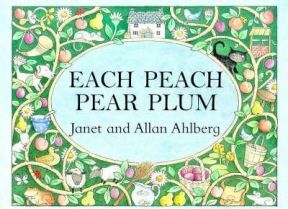 Each Peach Pear Plum is a really fun book by Janet and Allan Ahlberg that works well on a number of levels! Essentially it draws on children’s knowledge of lots of different nursery rhymes and fairy tales, bringing the characters together to tell the story of these people meeting with each other basically to have a picnic. Children don’t necessarily need to know the original rhymes and tales, but I think it adds to the enjoyment if they do! This is accompanied by a delightful illustration and the challenge is to actually spy Tom Thumb who is well hidden up a tree. As you turn the pages, the character you have spied on the previous page is also on the next, but there is also another well known character, hidden, that you have to spy – Mother Hubbard, Cinderella, the three bears, Baby Bunting, Bo Peep, Jack and Jill, the Wicked Witch, Robin Hood. Each of these characters is introduced through a rhyming couplet, and they also have to be spied in the picture, which is a lot of fun and this provokes a lot of discussion especially as they are not always that easy to find! Towards the end of the book though, things change slightly. We meet the three bears again, and they spy Baby Bunting who they then rescue from the river. Taking him with them, they go on their way and spot a plum pie which…is all ready for a picnic for all the characters to share. The final page of the book shows all these diverse characters sitting down merrily together to eat the plum pie! This is a delightful page and young children are likely to see all of the characters together like this. Both my daughters loved this book from an early age, but I do think that as they got older they got more out of it, because they became very familiar with a lot of the stories and rhyme. This meant that on each page not only could they spot the characters and enjoy the rhymes, but also recall bits of the original stories too. The rhyme also makes it interesting reading and my daughters enjoy filling in the end of the rhyme. Any books that include rhyme are likely to help develop their phonological awareness too which can only be a good thing. The illustrations in this book are wonderful. Every picture is packed with so much detail – so many things to look at and talk about. This book can also introduce young children to the game of I-spy as they can be choosing other objects to spy in the pictures. Our copy is a Board book with very strong card pages, although I have also seen a paperback version. So if you are looking for a fun and enjoyable read with your children I would definitely recommend this book! No Comments on "Each Peach Pear Plum"